No sugar added raspberry preserves with only 1 net carb per tablespoon. No artificial sweeteners. Gluten free! Tastes great! 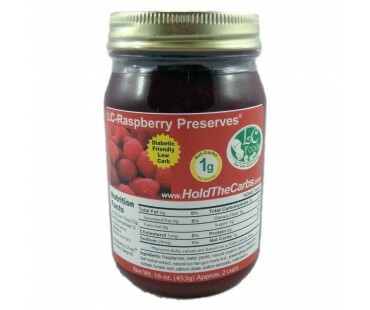 Enjoy our no sugar added raspberry preserves on your low carb fresh baked bread, toasted or how about a PBandJ sandwich? Try baking a batch of low carb butter or brown sugar cookies, make a well in each cookie and fill 1/2 teaspoon of raspberry preserves before baking as directed. You can make a glaze for pork, beef or chicken, or maybe a cheesecake topping? I Love this product from LC-Foods. Very spreadable, has some fruit pieces, nice taste and the best part no added sugar which helps me with my diabetes. I like the spreadability of these preserves. While normally I love all natural raspberry preserves, the natural sweeteners in this product seem to clash with the raspberry flavor. In fact, to me, they over power it. I think that maybe they've 'missed the mark' on this one. I'll try and 'doctor' this product myself, because I don't want it to go to waste. Sorry about the 2 stars, but I really think this needs to be improved.